flash memory – Carpet Bomberz Inc. In a terrific demo of the wrong technology for the Flash Memory Summit, HGST is showing a PCIe-connected Phase Change Memory device running at three million IOPS with a 1.5 microsecs read latency. via HGST brings PCM to flash show, STUNS world+dog with 3 MILLION IOPS • The Register. For a very long time I’ve been keenly following the IOPs ratings of newly announced flash memory devices. From the SATA->SSD generation and the most recent PCIe generation to the UltraDIMMs. Now however, this Phase Change Memory announcement has kind of pushed all those other technologies aside. While the IOPs are far above a lot of other competing technologies, that is for reads and not writes. The speed/latency of the writes is about 55 times slower than the reads. So if you want top speed on reading and not writing the data, PCM is your best choice. But 55 times slower is not bad, it puts the write speed at approximately the same speed as Multi-Level Cell (MLC) flash memory currently used in your consumer grade SSD flash drives. Chris Mellor’s emphasis is PCM likely better suited as a competitor to UltraDIMM as a motherboard memory than a faster PCIe SSD drive. And a lot depends on the chips, glue logic and Application Specific Integrated Circuits (ASICs) on the PCIe board. HGST went to great lengths to juice the whole project by creating a bypass around the typical PCIe interfaces allowing much greater throughput overall. Without that engineering trick, it’s likely the 3M IOPs level wouldn’t have been as easily achieved. So bear in mind, this is nowhere near being a shipping product. In order to achieve that level of development it’s going to take more time to make the thing work using a commodity PCIe chipset on a commodity designed/built motherboard. But still 3M IOPs is pretty impressive. via Resistance is not futile: Here’s a cookie sheet of luke-warm RRAM that proves it • The Register (Chris Mellor). Rice University is continuing research on it’s ReRAM (resistive RAM) and has come up with some new ways to manufacture it. That’s the key to adopting any new discovery first done in a lab environment. You have to keep tweaking it to find out the best way to manufacture it at scale and at a reduced cost. So in the four years since the original announcement was made, now it’s possible to manufacture the Rice U ReRAM. And at the end of the article there’s a note that some people are already buying up licenses for the technology. Hopefully that’s not just for patent trolling protection insurance, no. Instead, I’m hoping some small Fabless chip design house takes this up and tries out some batches of this and qualifies it for manufacture at a large scale contract manufacturer of silicon chips. When that happens, then we’ll have the kind of momentum required to make ReRAM a real shipping product. And with any like Rice U. will continue work on improving the basic science behind the product so it more companies will find it attractive and lucrative. Keep your eye on ReRAM. If Hewlett-Packard (HPQ) founders Bill Hewlett and Dave Packard are spinning in their graves, they may be due for a break. Their namesake company is cooking up some awfully ambitious industrial-strength computing technology that, if and when it’s released, could replace a data center’s worth of equipment with a single refrigerator-size machine. via With ‘The Machine,’ HP May Have Invented a New Kind of Computer – Businessweek. 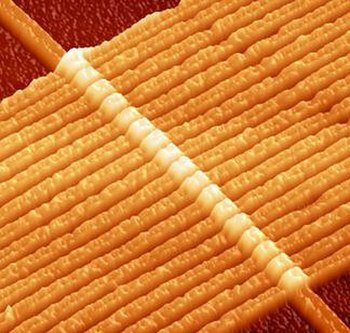 Memristor makes an appearance again as a potential memory technology for future computers. To date, flash memory has shown it can scale for a while far into the future. What benefit could there possibly be by adopting memristor? You might be able to put a good deal of it on the same die as the CPU for starters. Which means similar to Intel’s most recent i-Series CPUs with embedded graphics DRAM on the CPU, you could instead put an even larger amount of Memristor memory. Memristor is denser than DRAM and stays resident even after power is taken away from the circuit. Intel’s eDRAM scales up to 128MB on die, imagine how much Memristor memory might fit in the same space? The article states Memristor is 64-128 times denser than DRAM. I wonder if that also holds true from Intel’s embedded DRAM too? Even if it’s only 10x denser as compared to eDRAM, you could still fit 10x 128MB of Memristor memory embedded within a 4 core CPU socket. With that much available space the speed at which memory access needed to occur would solely be determined by the on chip bus speeds. No PCI or DRAM memory controller bus needed. Keep it all on die as much as possible and your speeds would scream along. There are big downsides to adopting Memristor however. One drawback is how a CPU resets the memory on power down, when all the memory is non-volatile. The CPU now has to explicitly erase things on reset/shutdown before it reboots. That will take some architecture changes both on the hardware and software side. The article further states that even how programming languages use memory would be affected. Long term the promise of memristor is great, but the heavy lifting needed to accommodate the new technology hasn’t been done yet. In an effort to help speed the plow on this evolution in hardware and software, HP is enlisting the Open Source community. It’s hoped that some standards and best practices can slowly be hashed out as to how Memristor is accessed, written to and flushed by the OS, schedulers and apps. One possible early adopter and potential big win would be the large data center owners and Cloud operators. In memory caches and databases are the bread and butter of the big hitters in Cloud Computing. Memristor might be adapted to this end as a virtual disk made up of memory cells on which a transaction log was written. Or could be pointed to by OS to be treated as a raw disk of sorts, only much faster. By the time the Cloud provider’s architects really optimized their infrastructure for Memristor, there’s no telling how flat the memory hierarchy could become. Today it’s a huge chain of higher and higher speed caches attached to spinning drives at the base of the pyramid. Given higher density like Memristor and physical location closer to the CPU core, one might eliminate a storage tier altogether for online analytical systems. Spinning drives might be relegated to the task of being storage tape replacements for less accessed, less hot data. HP’s hope is to deliver a computer optimized for Memristor (called “The Machine” in this article) by 2019 where Cache, Memory and Storage are no longer so tightly defined and compartmentalized. With any luck this will be a shipping product and will perform at the level they are predicting.